If you are following this blog for a while you may have noticed I rarely ever post about Panasonic plasmas. 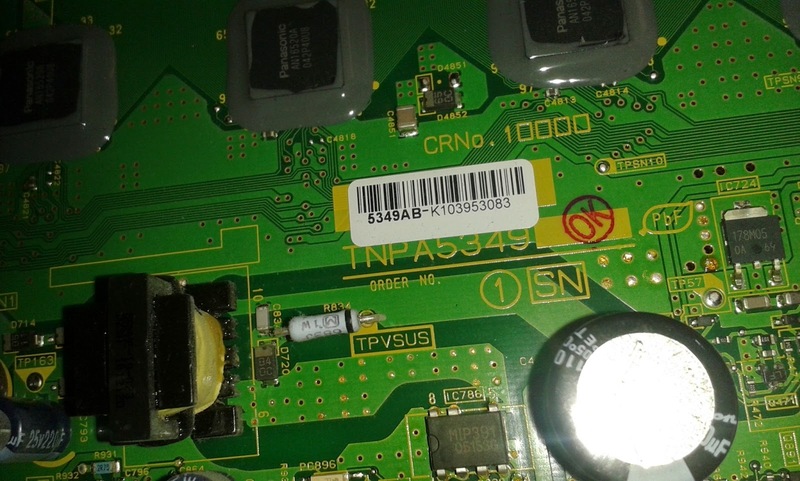 Customers often ask us if we can fix one or other TNPA board and we usually answer we do not work on Panasonic boards. When talking to laymen and not service tech the next question is almost always "are they that bad?". No, they are not. Or not much worse or much better than the others. We just do not have the resources to repair the three major plasma TV manufacturers in the world. Before that changes plasmas may become obsolete and I'd like to use that chance to give a clue on repairing a Panasonic TV. 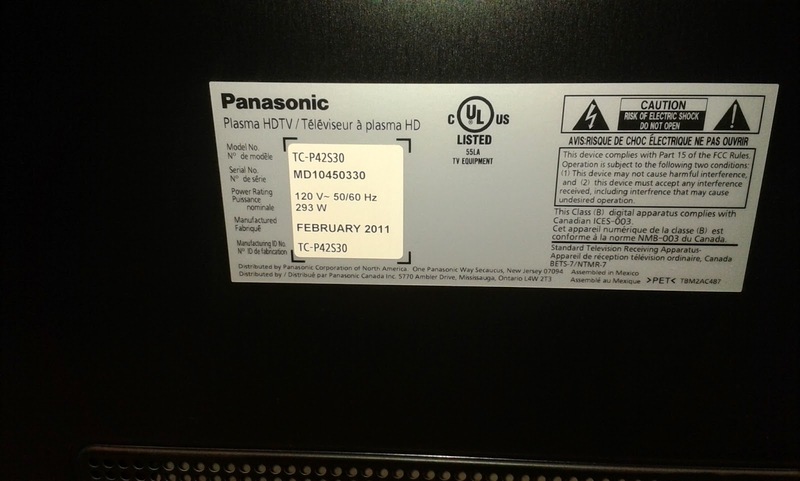 A Panasonic TC-P42S30 was brought the other day in shop for repair. Failure symptoms: The symptom was as stated in the title: the TV would click on, produce no image and click off within a few seconds. It may have been giving an error code through a number of blinks on the power LED, but I did not pay attention to that. 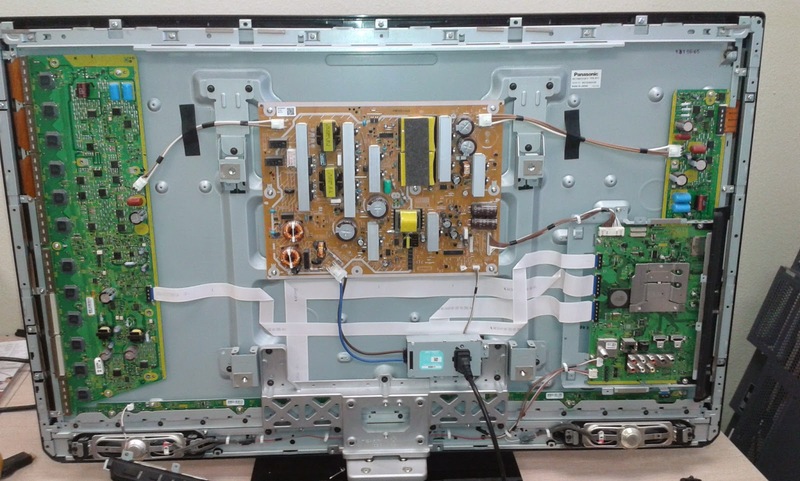 Troubleshooting: Like most other plasma TVs Panasonics are know for failures in power supply boards and the sustain boards (of course some also fail in the main or elsewhere, but those are less). The power board was clicking, which means it was getting standby power all right and the failure would have been on either the main power circuit (+5V main, +Vg (if present), Va, Vs etc.) or in a sustain board. After a quick check on the fuses of the power as it was mounted on the TV and finding nothing we moved for a quick check on the power components of the Y sustain board (SC board in Panasonic terminology). Those were the Q441 transistor DG302 and the D481 diode RF1501. 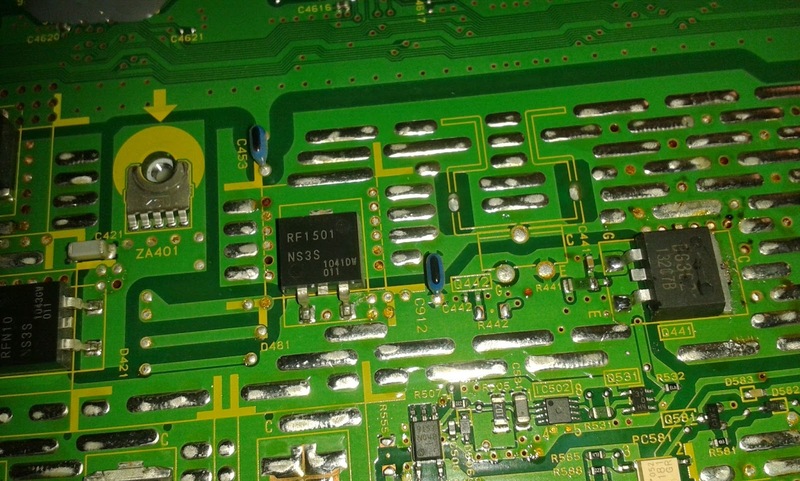 When we removed the transistor from the board the shortage over the diode disappeared and it read normal. The DG302 transistor was the only failure on the board in this case and replacing it restored functionality of the set. DG302 is popular choice in many Panasonic sets and is used both in its SMD and heat-sink mountable packaging. Both DG302 forms can be purchased at our site (and likely other places). At below $10 and relatively easy processing (compared to many other repairs) this is definitely worth doing. 1) If you are into electronics and doing things right I'd recommend you get TWO transistors and enhance the stock Panasonic build with TWO transistors working in parallel. There's plenty of space to solder another one there and you'd need to run a 5.6 ohm resistor from the gate to the point on the board just after the 5.6 ohm resistor of the original Q441 is. You'd also need to run a wire from the third leg to the third leg of Q441. Cutting the load in two this way you can rest assured this transistor is not going to fail you again. 2) There will be cases when this transistor won't be the only thing that has failed on the board. 3) Inserting the display FPCs into the SC output connectors has been a PITA for this set. Do not affix the SC board in place with the screws- put one or two in, but let the board loose. That helps the insertion and still be extra careful to make sure you've plugged both ears evenly in the connector. Good info and I enjoy this site! ( I have purchased your parts.) TV tech for over 39 years. I had this same problem with my TV. I replaced Q441 and D461 (in my case) and I was able to watch TV for about 3 minutes before the 4 30F131 transitors blew (Q401, Q402, Q421, Q422 and a couple of the diodes in the same circuit -- the most common problem with this SC board). What should I check that would cause these to blow after replacing the same chips that you replaced in this blog post? You mention that these two chips may not be the only thing wrong with the board. I have also heard mention of "Gate Driver" IC's that are D86 type (IC501 or IC502) that could be bad and causing a problem as well. I am not sure how to test these or where to even get the part, however. What would you recommend that I check other than Q441 and D461 when this problem occurs? Are you saying that the parallel dg302 needs a separate gate drive resistor that is connected to the other dg302's gate drive resistors input. Can't you just parallel all 3 legs of the dg302's together? emitter stray inductances produce different ugate-emitter voltages (VGE) during switching. I have a TC-P42S30 set at a vacation home. It continually shuts off after anywhere from 2 hrs to 20 min of playing time. I have done resets 3 times and cannot correct the condition. I have to unplug and replug to get the set to work. Do you suggest replacing the power supply board, or can the problem be linked to a cheaper fix on the board itself, or a different condition? I see the power LED light glows red. I don't know if the power led blinks or not when plugging back in and manually switching it back on.